We can help save your teeth! It may be possible to save a tooth whose root has become infected by performing a root canal treatment. Modern root canals are now relatively comfortable and pain-free and can help you keep your smile as natural as possible. Wisdom teeth typically erupt at around age 18-25; however, most wisdom teeth become impacted (don’t erupt) or erupt crookedly, affection your health and the health of adjacent teeth. 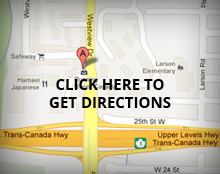 For your oral surgery appointment or to have any of your questions answered, please contact North Van Dental.